The assignment today is to link a photo of our personal action verse. I had this image on one of my Pinterest boards. 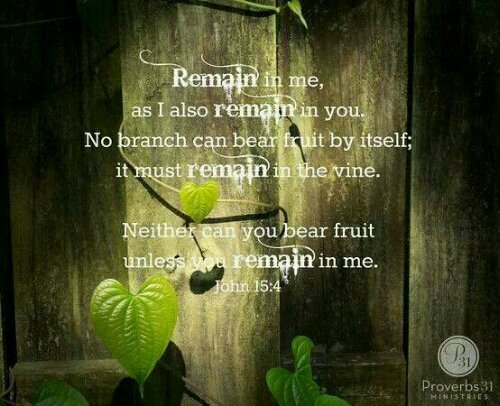 I chose this verse because as it says, if we don’t abide (remain, attached) in Jesus (the Vine) we can do nothing. I really want this time to be different than all the other times I’ve tried to lose weight. I really want it to be a spiritual journey with the benefit of physical health and well-being. I want the result to be not only weight loss, but a healthy new lifestyle. For this to happen I need to stay grafted into Jesus, the Vine. I need Him to be in all I do and the strength that I use to make good choices all day, eat well, and move my body – by communicating with Him all day long. I am currently a homemaker, so I spend a great deal of time alone. I have always been one to keep the TV on all day for “company.” But, it encourages me to sit for long periods, even if I am not actively watching it. But since beginning the first M2C study back in January God’s been working on that, too, as a part of this journey. The TV is staying off (most days) until hubby turns it on after work. I’ve never been a fan of silence, but I am learning to like the silence, because it allows for a lot more spontaneous conversations with God throughout the day. It gives me the opportunity to do something that a mentor, Joanne, once told me: “Julia, the Lord wants you to ‘tune-in’ to His voice more.” It’s hard to tune into God’s voice, that still, small voice, when there is so much distraction and noise. The silence also gives me the opportunity to worship our Lord – either in spontaneous song or putting on some music, which always prompts dancing (moving my body aka exercise) =). It’s a win-win situation. Abiding in Jesus, the Vine, the Source of life and strength, is the only way this journey to Craving God and not food, TV (noise)… is going to be truly successful. When Joanne told me to tune-in my first thought was that I was already hearing God pretty good. But, I respect her and took it and started seeking God in it. Tuning in goes deeper than casually listening. It’s being purposeful about making time to sit in silence praying and then listening for His voice. This prepares me to hear and recognize His voice when He speaks to me in a specific situation, through a person, a song, or a Bible verse. The tuning in really needs to be intentional, otherwise we will miss Him in the everyday things. God has a plan and purpose for my life (and yours, too). Being 115 pounds overweight at 53 years of age makes it hard to have the energy and stamina I need to fulfill the plan for this half of my life. Taking action now to change my lifestyle and health is an important step in fulfilling my God-given destiny to teach God’s Word and encourage women of all ages on their own faith journeys. Thank You, Jesus, for never giving up on me even when I’ve wanted to give up on myself! What a wonderful verse to choose. I truly needed to hear the words you shared today. I love how we can encourage one another in what is important … Abiding in Him, removing distractions, focused attention on hearing from our Father (really hearing). Thank you for sharing your heart! I am touched, Pam, thank you! Beautiful, Julia! Thanks for this reminder today! Julia, I love this and can relate so much to wanting this time to be different. Love the verse and picture. Thanks for sharing. Julia, thank you for this. “Abide in me and I will abide in you” is one of my favorite verses, and it actually was the first one I thought of when we were asked to post our favorite “action” verse. Thank you for talking about it in this way.